Avengers Assemble: Science Bros collects issues 9 through 13 and Annual #1 of this series as it moves into Marvel NOW! 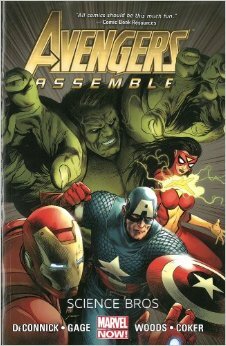 With stories written by Kelly Sue DeConnick and illustrated by Christos Gage and Stefano Caselli, the volume provides a diverse set of three Avengers tales that vary from large scale adventure to personal reflection. And it is likely the Marvel Cinematic Universe fan will find something to enjoy. This volume is broken into three main stories. In the first story the personalities and approaches of Tony Stark and Bruce Banner are compared. This refection leads to a competition to be the first to find a rouge scientist in a race that contrasts technology and pure science. But the competition takes a tragic turn as Yun Guang Han uses ancient bacteria to create an army of monsters from the Avengers. In the second story, Black Widow is called to Russia to pay off a debt from her pre-hero years. With Hawkeye and Spider-Women in support, the trio faces off against lizard super people. And in the final story the resurrected Vision struggles with feelings of belonging and family within the Avenger context. For Marvel Cinematic Universe fans, the Black Widow story resonates the most. In this tale, Romanoff receives a marker, which apparently she gave out for each bad act she perpetuated as a Russian spy. In this case, she assassinated a man who may have been a good person. Romanoff flies to Russia discovering his daughter has disappeared and the three Avengers seek her out in the subterranean tunnels. The three find an entire society of lizard people transformed by the late scientist’s discoveries. In this story, Romanoff voices, “I have red in my ledger.” For most MCU fans this line is instantly recognizable as a life from The Avengers. And the entire story feels like the MCU Black Widow could easily take the place of the Marvel 616 version. You could imagine the big screen version working off her debt in the pages of the comic. And most MCU fans would be interested in who holds one of her outstanding eight markers. The main Science Bros story will also catch the interest of MCU fans. However, it may not be the story we want to see. I get the feel from the MCU that Stark and Banner are friends. They may have different interests and personalities, but they are supportive friends. In this story, and in The Indestructible Hulk, the two great minds are depicted as intellectual rivals. The two men are brilliant, heroes, Avengers, and nothing alike. They are friends, but contrasts to each other and in a silent duel. This is not the Banner and Stark to me whom ride off together after sending Loki back to Asgard. Now, I am willing to say that this version of the Banner and Stark could exist in the future MCU. But that would require more character development than I think we will see in on the big screen. The Vision story is interesting enough. It makes one think as Vision asks his teammates why he was left in a box in a warehouse while he was dead, instead of them trying to bring him back to “life”. They have a number of explanations, but really you are watching Vision process his way in his world. And it is emotionally painful as you watch his former brother-in-law Quicksilver insult him and his robotic nature. In the end, Vision is really trying to find his place in this world after coming back from death. And I would like to think that this story does put Vision on a path towards connecting with living other beings. Avengers Assemble: Science Bros will likely make the Marvel Cinematic Universe fan comfortable as themes from the movies are explored. The red in Black Widow’s ledger instantly brings us back to the movies. But the depictions of Bruce Banner and Tony Stark and their relationship may feel very separate from the MCU. Overall, with stories of very different tones and using different characters this volume will provide something for most readers to enjoy.